$45 for 2 Months of Kids Clothing Delivery Service ($80 Value) + 10% Off Code! Head over to Plum District to score 2 months of new kid's clothes delivered to your door from Wittlebee for $45. This is an $80 value! Use the code visa10 at checkout to save 10%, making it just $40.50. Wittlebee is a monthly clothes delivery service for kids that aims to keep parents well stocked with the basics like onesies, t-shirts, socks, leggings, and more. They create custom packages for members based on their child's age and other preferences. 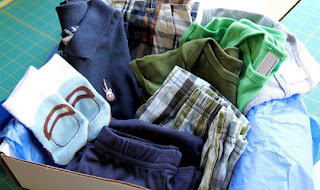 Members receive a shipment of clothes every month with sizing that grows along with your child.